The MLB shortstop revolution is here—and it’s being led by Carlos Correa. The Houston Astros star, along with players like Addison Russell, Corey Seager, Francisco Lindor, and Xander Bogaerts, are changing what it means to be a shortstop. Teams are no longer satisfied with defensive wizards whose glove skills make up for less-than-average offense. Instead, clubs want a heart-of-the-order hitter who can handle the most important infield position—and Correa completely fits the bill. The 6’4″, 220-lb Correa has quickly become one of the most exciting players in baseball, blasting home runs, playing Gold Glove-caliber defense, and leading his team to the top of the American League. Now, he’s helped his team win the 2017 World Series over the Los Angeles Dodgers. Just a few years ago, the Astros were losing 100-plus games per season—one reason why they were able to draft Correa with the top pick in the draft—and now they are champions. Correa played a major part in making that happen, putting his team in position to keep winning for years to come. How did he do it? Countless hours in the gym and hard work in the batting cage. Correa made his MLB debut when he was just 20 years old in 2015, going on to win AL Rookie of the Year and become the youngest shortstop to hit a home run in the playoffs. Even though Correa is young, he carries himself like a veteran and understands the preparation it takes to succeed at this level. Correa also has no problem bringing some extra data and analytics into the conversation, too. The shortstop has worked with Blast Motion, using their swing analyzer technology to study video, looking at his bat path, speed, and swing angle, helping him with his mechanics and honing in on the specific adjustments he needs to make at the plate. Repost from @blast_motion using @RepostRegramApp – When you want to be the best, the work never stops. 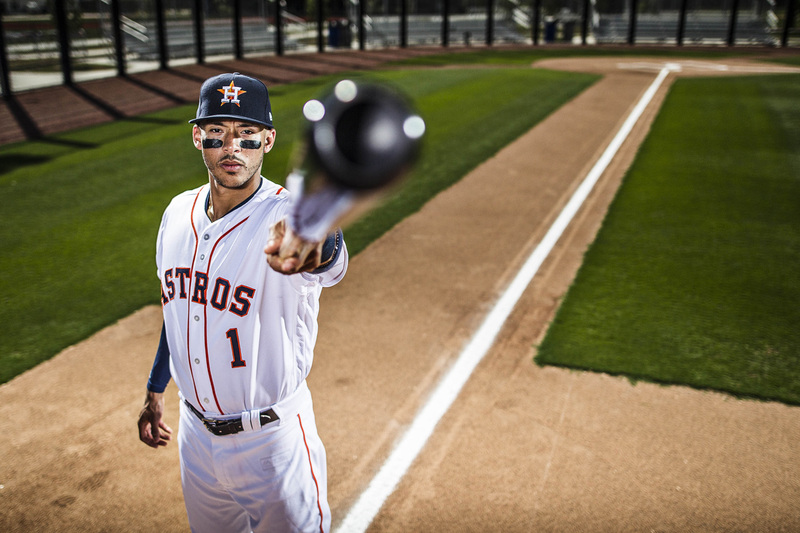 #Baseball360 helps @TeamCJCorrea grind through the offseason. Correa isn’t afraid to critique himself—he spends hours watching video to refine his swing, and makes sure his mechanics are sound. Correa has had high expectations following him his entire life, and at every stage he’s delivered. The Puerto Rico native started playing organized baseball when he was five years old, graduated from high school as valedictorian, and entered the MLB draft at just 17. The Astros made him the first overall pick after he left scouts “blown away” during a team workout. Before the 2017 season, Correa experienced some newfound attention while playing in the World Baseball Classic for Puerto Rico. The team made an undefeated run through the tournament before losing in the finals to the United States, gaining fans from around the world with their brash, exciting style of play, and, of course, their matching blond-dyed hair. With the way his career has started, Correa soon enough will be the one teaching young players the right way to play the game.